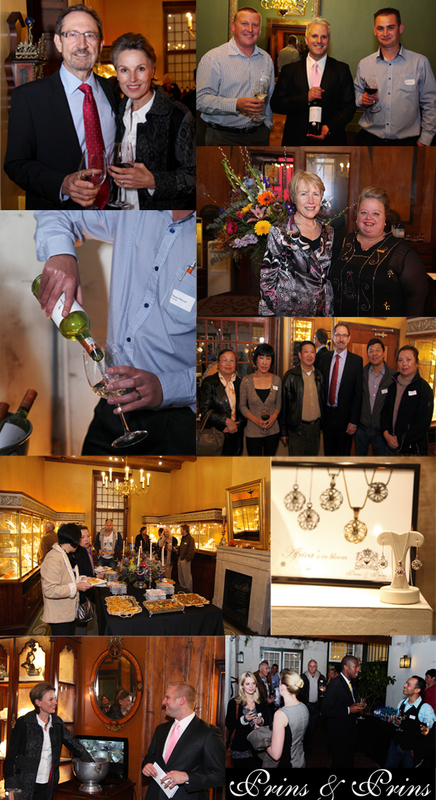 Things have been quite busy at Prins & Prins Diamonds these past two weeks…..
At an exquisite cocktail event we unveiled our new Spring Jewellery Collection – “The Jewels of Spring” to all our partners in the Tourism Industry. It was an incredible evening of excellent wine – compliments of our partners at Zorgvliet Wine Estate, good food, excellent company and wonderful prizes that were given out on the night. Zorgvliet were proudly represented by their resident winemaker Neil Moorhouse, and Marketing and Sales Executive Shaun McLeod. We would also like to congratulate Zorgvliet Wine Estate on their recent Double Gold Award for their Zorgvliet 2012 Sauvignon Blanc, and their Gold Award for their Silvermyn 2012 Sauvignon Blanc at the Michealangelo Awards. What a wonderful achievement! We wish to thank everyone for their loyal support and we look forward to continue providing excellent service, paired with exquisite jewellery at extremely reasonable prices!